Make brushing fun with the Colgate® Minions Battery toothbrush. With better cleaning than a manual brush, the extra soft rotating head gently sweeps away plaque with ease. 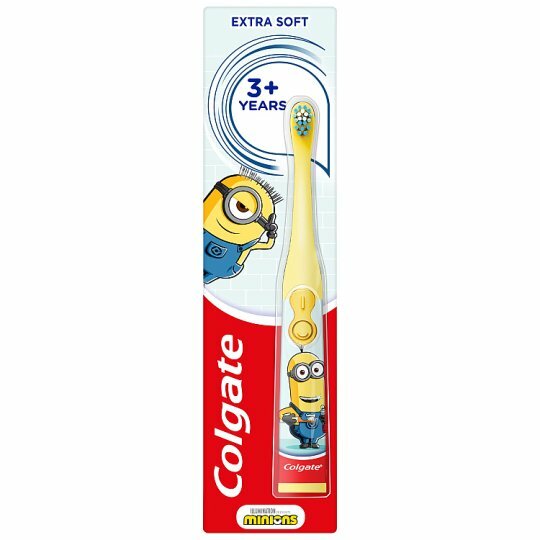 Let your kids choose their favourite Minion and switch on the fun of brushing. Directions: Brush twice a day under parental supervision. Make sure children spit out the toothpaste after brushing and avoid rinsing with water. After use, rinse toothbrush head thoroughly, shake off excess water and store upright. Dispose separately from household waste and always remove battery before throwing away. DO NOT BITE OR CHEW. FOR TOOTH BRUSHING ONLY. DO NOT USE AS A TOY. NOT INTENDED FOR CHILDREN UNDER 3. WARNING: BATTERY CHOKING HAZARD. BRUSH HEAD IS NOT REPLACEABLE. Replace brush if head comes loose due to damage. Adult supervision required for children under 8.